It’s autumn in France and we’re struggling to adjust to the rapid changes of temperature that each day brings. The one who does the morning dog walk puts on a variety of warm clothes and leaves the van reluctantly with two excited little dogs. Before long all three return with wet feet and cold wet noses. By lunch time we’re stripping off the fleeces and two hours later we’re desperately seeking shade as the heat rises to the high 20s. Some evenings the clear skies bring freezing cold conditions and we snuggle under our big soft blanket when we get into bed. Other nights, when there’s a little cloud cover, the heat of the day lingers and we flop into bed with no covers and weigh up the relative merits of opening a window and risking getting bitten by insects or keeping it closed and overheating. Local people must carry two wardrobes with them to work each day. If you’ve been following our journey you might be wondering where we’ve been these last week or more. The reason for the silence is a frustrating one. I wrote an entire blog post a couple of days ago giving the low down on our adventures and then lost the whole thing in the mysterious depths of the digital world. Foolish in the extreme I had taken a short cut and written directly into the WordPress application and then made an even worse rookie mistake – I ignored a little flag that came up and said “Do you really want to leave this page? Doing so might do irreparable damage including slipping on the soap in the shower, a rise in the price of oil, running out of chocolate or indeed you might lose your work.” Yup. I lost 1800 carefully crafted words and half a day of my life. If you’re a fan of writing you will understand that once the words have left your brain, landed on the screen and then disappeared you simply cannot recreate them with as much vigour as you did the first time. The creative muse had settled down for the night and doggedly refused to be coaxed into action again. It is now thirty six hours later and I woke up with the urge to write again – so here goes. Returning to France after our little jaunt into Spain, it occurred to us that we were in our last three weeks of the trip. We had so little time and so many places to explore. There were two places we definitely wanted to share with Mary, so we set about visiting them without delay. LaBastide D’Armagnac is one of our big favourites. It is a tiny mediaeval town where motorhomes are made very welcome and you can pause to breathe beautiful rural French air, wander through streets that appear unchanged in centuries, walk the voie verte in the sunshine and take a little refreshment in one of the café bars. We knew that Mary would be enchanted by the ancient buildings in the town square and the slow pace of life where locals can be seen passing the time of day by the old water pump or outside the boulangerie, appearing to have nothing better to do that just be. In all the times we have visited we have never seen anyone rushing anywhere. For our customary meal out in this fine place we chose lunch at Le Bastignac – a small restaurant that looked as though it was closed from the outside. A small sign that said “We are open” encouraged us to peek inside and to our amazement we found more people sitting at tables than we had seen in any part of the village since we arrived. It was clearly very popular with the locals and this was enough to encourage us to go inside. The dining room was created from an ancient bare stone room with heavy dark antique furniture and burgundy tablecloths. The ceiling was low and the light subdued yet it was definitely cosy and the welcome was warm. My previous culinary experience of this part of France has found gizzards to be all too often on the menu so I was a bit dubious when I realised that the three course menu du jour was set. It was a take it or leave it kind of affair but we need not have worried. The meal started with a massive soup tureen being delivered to the table with a basket of bread, a ladle and three bowls. Clearly we were to help ourselves. Three large bowls of butternut squash soup later we had made hardly a dent into the gallons of soup. Shortly after, a platter of fries with garlic and parsley on top along with a baking tray filled with six chicken breasts appeared. The chicken was baked in plum and raisin sauce and it was heavenly. The only problem was that the quantities were the kind a farm worker would appreciate – we did our best but once again couldn’t finish the offerings. The dessert was thankfully smaller and we ended with the typical short shot of strong coffee that was exactly what was needed to wake us up enough to walk back to the vans. If you get the chance to visit we can recommend it. A set three course lunch that will last you all day and is beautifully cooked and warmly served all for 16€ each. Lovely. After two nights of walking, sketching and eating we set off again for Moissac – another of our all time favourites. On our last visit we met a British couple and chatted a bit with them in passing. Before long we discovered that the husband fell into that category of the male gender – The Mansplainer. This is the type who assumes that you know nothing and that you need to have every small detail of life explained in minutiae of detail and in words of one syllable. On the subject of motorhoming no amount of reminders that you’ve probably spent more time on the road in the last two years than most do in ten gets through. The kindly advice goes on and on and on. We had described this person to Mary when we told her about our last visit and we had laughed a bit, telling her that it didn’t spoil our stay as Moissac is so lovely but it did require the patience of a saint. It was therefore something of a shock to discover, once we’d parked the vans, that our friends from last year were back in residence – if indeed they had ever left. We took a deep breath and greeted them warmly and before long we had come to the conclusion that the endless advice was kindly meant, if a little bit over the top, especially when he gave Shirley detailed information on the use of the chemical toilet while she was emptying it at the service point. Our new found patience was to be tested further however when a new neighbour pulled in next to Mary’s van. The van was huge and very expensive and out hopped a large Belgian gentleman with his, we now realise, long suffering wife. This new arrival brought the art of mansplaining into a whole new sphere. A few hours later, I was inside the van pottering about, as you do, and Mary and Shirley were sitting outside enjoying the sunshine… the unwitting soon-to-be recipients of this man’s endless wisdom. To my shame I remained hidden and listened, smirking, to his monologue that consisted of his feelings about Brexit, Scottish independence, the doom that was about to befall Mary because she had chosen a van on a Mercedes base, the fact that he didn’t like the English but loved the Scots and the dreadful truth that the French were an unfriendly breed that should be avoided at all costs. He appeared to have mastered the art of circular breathing as there were no pauses to give either of them chance to make an excuse and run. Eventually his wife must have taken pity on us all because she called him in for dinner. The next day he was back and by some miracle I was inside the van again. This time he gave them the benefit of his wisdom as to how you know how many times a man has been married. Apparently the first time the woman does all the work, the second time they share it and the third time the man does all the work. I have no personal experience to verify these facts but they sound dubious to me. Suddenly he turned to Shirley and asked her if she had a husband and if so how many times had she been married. At this point she got her answer in fast and it was a cracker, “No but I have a wife.” He was speechless for all of ten seconds. At this point I decided to go outside and show my face, hoping that I could help them get away from his endless chat but it was hopeless. He just moved seamlessly onto his next subject and kept going until his wife once more rescued us. It was an enormous relief when they drove away the next morning. I’m still smarting from his comments about the English but as he had no time for the French either I can only assume that people of both nationalities had finally told him to button it and walked away. So, back to Moissac. We’ve been here twice this year and we will definitely be back. 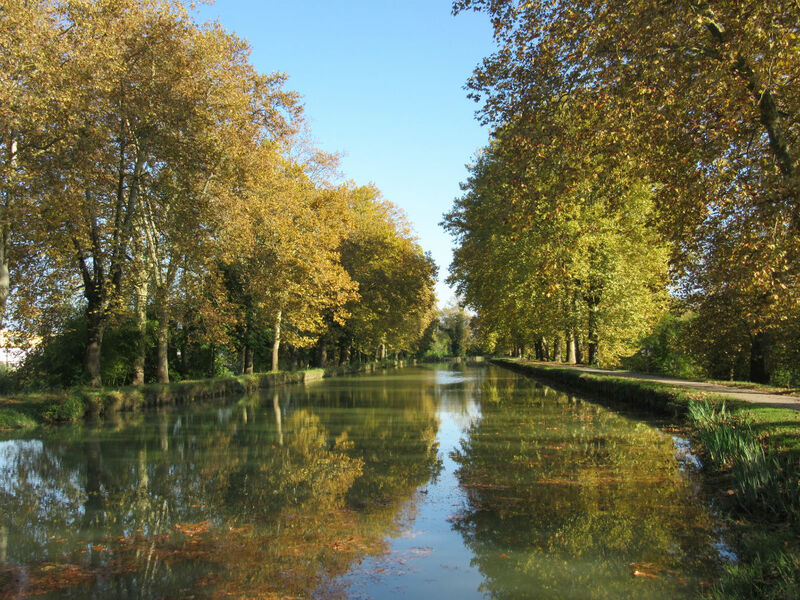 Everything you could need is within walking distance, there are delightful walks along the Canal de Deux Mers which is part of the Canal du Midi and also along the Tarn river, both of which flow through the town. The best chocolate ice cream in the known universe can be enjoyed in Scrakoss, a delightful café bar on the street going up towards the Abbey. A friendly welcome, a lovely ambience and a unique little place – we loved it. The aire is manicured and neat with services including electric. Out of season it is 6€ a night, high season 8€ and it is worth every penny. The canal basin has a splendid atmosphere with all the gentle activity around the boats that you might expect and a wide variety of languages and accents poured into the mix. There is a large food market on Saturdays in the town square and a street market on Sundays. Local produce is displayed on numerous tables and you can go into the municipal market to buy fresh meat and fish. Healthy living at its very best. I had just finished writing this post, now that we’ve moved on from Moissac, and the very second I finished I received my poetic justice. Closing the lid of the laptop, I decided to go and fill the watering can to top up the fresh water tank. Here there is the type of service point that requires a two ended hose adapter. Feeling pleased for the second time this trip that we had this unusual bit of kit amongst our selection of water connectors, I set off with the short hose, the adapter and the watering can to the service point. When you push these things into the tap the water starts to flow immediately and I was ready for it, watching the water flowing neatly through the short hose and into the watering can and feeling a great sense of satisfaction. This lasted for about one minute until I realised that I didn’t know how to stop the flow of water. I yanked on the hose and it disconnected from the adapter, allowing gallons of cold water to shoot out of the adapter all over me and for about twenty feet behind me. I was helpless, every time I tried to disconnect it I just got more wet. Looking up I saw a man sitting on a bench trying not to laugh. I shrugged helplessly and he mimed pushing the metal tap backwards while pulling out the adapter. This stopped the flow immediately and I thanked him before limping and squelching all the way back to the van where Shirley collapsed into giggles. I will write 100 times I will not mock a man who tries to help me – until the next time that is. So glad you took the time to re-write your blog but I have to say you need to take Mary with you on all the trips. Between your written description and Mary’s wonderful illustrations, you have created a masterpiece. Oh dear! I feel your loss of 1800 words and the time and creativity too! Well done for the catch up, I’m sure all us readers appreciate the effort it must have taken. Your meal sounds lovely and you’re in villages we haven’t previously visited but will definitely put on our list. The meal sounds heavenly. Back here in Scotland the sun may be shining but it’s to be a ‘high’ of 7 degrees, enjoy the warmth while you can. Good to read your well written and informative blog once more. La Bastide is also one of our favourites as it is “local” to us s we live between Auch and Tarbes. we had lunch there as well, generous and well cooked local fare. Must admit we have also been the victims of the ” I can only talk to you as if you are a six year old” adjacent-parked motorhome and the only sure way to rid ourselves of one of these is to to be short and sharp in our reply. we realise that deep down they feel they are doing the Motorhoming world one big favour but……….someone has to live with this person!!!! Keep them coming. You live in a lovely area. We’ve been tempted to move to France several times but the lure of Scotland and home wins every time. We’re grateful we have the motorhome to keep coming back! One of my Mantras is don’t start something until you know how to stop it but I too, would probably have soaked myself as well. Keep up the good work. We are in the auvergne region and have holed up on an aire as it is snowing quite heavily so I’m catching up now. We capsized quite dramatically while kayaking but it was something I have wanted to do for years so dream come true. Very entertaining Mags! We also visited Moissac this time and really loved it as well, although it was Monday and the town was completely closed apart from the church and the cafes next to it! We went to Brive to find the restaurant lauded by the Sunday Times – they have had so many UK visitors this year as a result of the article. Le Comptoir Saint Sernin was terrific. After Brive we called for coffee at Uzerche, also in the Correze, where we would have liked to stay longer. My hairdresser had recommended a restaurant – ‘A table’ – owned by 2 English women at Cherval near Verteillac, (www.atablerestaurant.com/) which we wanted to visit but we didn’t have the time in our short (1 month only!) trip. I also enjoyed Mary’s pics and have noted LaBastide D’Armagnac for future ref, it looks lovely. Hope you’ve dried out now! Hi Catherine! If only we had the time and the metabolism to try all these lovely restaurants. Simple French lunches are a delight – and far from simple. We’re in our last two weeks now – can’t imagine how you did it in one month but it sounds like you had a great time.